For decades, Alpine Eavestrough has been successful in completing multiple Masonry Services in Calgary. 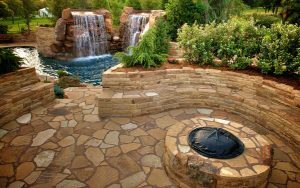 From stone steps to entire landscapes, our team of specialists can handle all types of stone work services. We specialize in all kind of stone finishes including natural rock, premanufactured rock, brick and block. Our Calgary Masonry portfolio includes fireplaces, chimney stacks, stones homes, flagstone patios, gate columns brick columns and houses. Our experts have the ability to restore old and unfinished masonry projects, giving you something new! The consultation prior to beginning our work requires a comprehensive collaborative session with our client, architect and project manager. Our goal is to exceed expectations and understand even the most minor details. 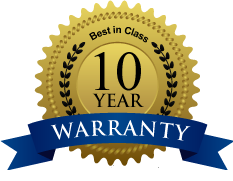 All Calgary Masonry workmanship is handled with security in mind. We operate using the highest standards of safety, that is why we create fireplaces, fire pits, column paths, chimneys and walls with the finest durable materials. Once the project begins, open communication and ongoing consult with the client is crucial to ensure complete satisfaction. We have the experience that will help you with your unique stonework job, combining the natural beauty of rock with delicate architectural details. Before every job, we have a comprehensive appointment session with the client, architect and project manager to be certain all expectations and details will be fulfilled. All Calgary masonry work is given with security in mind. Safely operating fireplaces, sturdy walls, and chimneys, columns paths, barbecues, fire pits etc. using only the finest materials After a project starts, ongoing consultation with the customer will make sure that you will be fully happy with our job. If you want to see references and samples of our work view the online photo gallery at which we're pleased to showcase a few of our previous work. Do not hesitate to contact us to learn more about individual jobs - we offer free consultation and quotes. 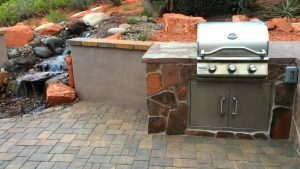 We have the experience that will help you with your unique stonework job combining the natural beauty of rock with delicate architectural details. Please feel free to call us if you have any questions.